Caged By Its Noble Intentions: 'The Zookeeper's Wife' This historical drama, based on the story of a Warsaw couple who helped hundreds of Jews flee Nazi-occupied Poland, is more interested in their heroism than their humanity. 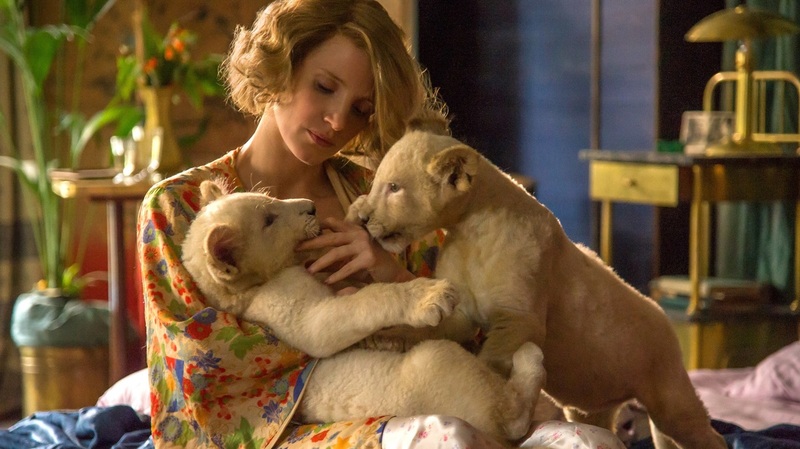 Borne, Freed: Jessica Chastain as the lion-hearted Antonina Zabinski in The Zookeeper's Wife. You'd think the absolute worst thing that a WWII movie could do is compare its huddled masses of Jews to animals. But The Zookeeper's Wife turns out to have a pretty good justification for equating the two. It tells the story of the Zabinski family, who ran the Warsaw Zoo during the war and who secretly helped relocate hundreds of Jews fleeing German-occupied Poland. The Zabinskis used their abandoned cages in storage — which had held animals, until the Nazis either relocated the beasts to German zoos or shot them — as waystations for the refugees, who'd just escaped a much harsher caged existence in the Warsaw Ghetto. Now they had to huddle amidst the hay and feeding products, and train themselves not to fidget or make a sound until they heard Antonina Zabinski play a certain melody on the piano. We are seeing this story play out from the perspective of the Zabinskis, who are naturally compassionate people but prior to the war had only needed to exercise that compassion on their zoo collection. So it makes perfect sense not to encounter the Jews they saved all that closely as true characters, even though the omission feels crude from a distance. Director Niki Caro and screenwriter Angela Workman have created, perhaps unintentionally, a sensible balance sheet for all living things. Zookeepers protect animals because they are alive and unique and deserving of our love; why not do the same for people, just because? To be sure, Antonina worked in tandem with Jan and was as essential to the Jew-smuggling operation as she was to the animal upkeep — the title is meant to be ironic. And Chastain (who, like Heldenbergh, can fake a good Polish accent to distract us from the fact she's still speaking English) makes her into a magnetic, principled force who can hold her own even when sharing the screen with a live rabbit. But the movie never shows Antonina writing in her diary, so we miss the context of why it's her story. We also miss a lot of the fascinating details of her character that informed the book: for example, that she gave animal code names to her refugees, further drawing home the unsettling parallel that makes the story so distinctive. Instead, to fill time and add artificial layers of steely determination, we see Antonina try to outmaneuver some horndoggery from villain Lutz Heck, head of the Berlin Zoo and Hitler's chief zoologist (played by poor Daniel Brühl, Hollywood's go-to Nazi and/or Nazi descendant). Heck was, in real life, a man of untenable contradictions. Though a professed lover of animals, he didn't hesitate to kill the four-legged denizens of the Warsaw Zoo; he also launched a Jurassic Park-style breeding program attempting to resurrect extinct species of cattle and horse, including the mythical auroch. But the film's characterization of him is lazy, making him a kind face for the first act before flipping him to abject, predatory evil. Jan pouts jealously in the background whenever Heck pays Antonina any attention, as though she chose to entertain the affections of her zoo's Nazi occupier. The early scenes in 1939, as the war breaches Poland, are the most compelling. When the zoo becomes the target of a sustained bombing campaign, Caro cuts between several heartbreaking shots of the animals in their cages, panicking at this strange threat but unable to flee it: cheetahs pawing uselessly, monkeys screeching to no one. Having already been put on display for man's enjoyment, they must now die at the hands of man's wars. Caro overdoes this symbolic power a few scenes later, when Heck shoots a bald eagle (of all things). But this feels, for a little while, like the rare WWII movie with the power to speak to injustice in many different forms. If only a lumpy second act didn't come along to mute that power with bait-and-switch heart-tuggers and some truly idiotic behavior on the part of Antonina's bratty son Ryszard (Val Maloku). We are invited to compare The Zookeeper's Wife to its most obvious reference point, Schindler's List, which also revolved around one citizen's clandestine operations to save hundreds of Jews. Though Oskar Schindler's evolution from proud servant of the Nazi Party to secret humanitarian was a far more cinematic journey, the Zabinskis were local figures of merit who took a principled stand for goodness, making them more appropriate to our current era. The Zookeeper's Wife is more of a utilitarian exercise than Spielberg's genre-defining monument, as Caro fails to find the same spark of compassionate moviemaking that ignited her masterpiece Whale Rider, or even her perfectly enjoyable take on sports movies, McFarland, USA. But it certainly has more going for it than, say, 2015's Woman in Gold, which cynically glad-handed its audience in an effort to convince them a battle over art restitution could count as a variant on "Never Forget." Perhaps this film's promotional partnership with the International Rescue Commission, which aims to help today's refugee populations from all over the world, has given it a grander sense of purpose. Too bad no one could let it out of the cage where we keep the American-made Holocaust melodramas. The Zookeeper's Wife will be condemned to pace back and forth on display for an easily pigeonholed audience, never truly knowing freedom.